The Colossus of Rhodes | Pan Rhodian Society of America "Apollon", Inc.
Pan Rhodian Society of America "Apollon", Inc. The Colossus of Rhodes is familiar to almost everyone. Its history begins with the siege of Demetrios Poliorketes, successor of Alexander the Great, in 305 BC. When Demetrios was defeated, he abandoned all his siege machinery on Rhodes. The Rhodians decided to express their pride by building a triumphal statue of their favourite god, Helios. The task was assigned to the sculptor Chares of Lindos, a pupil of Lysippos himself, and twelve years (from 304 to 292 BC) were needed to complete it. From its building to its destruction lies a time span of merely 56 years. Yet the Colossus earned a place in the famous list of Wonders. “But even lying on the ground, it is a marvel”, said Pliny the Elder. 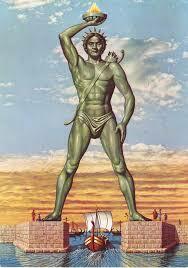 The Colossus of Rhodes was not only a gigantic statue. It was a symbol of unity of the people who inhabited that beautiful Mediterranean island of Rhodes. To build the statue, the workers cast the outer bronze skin parts. The base was made of white marble, and the feet and ankle of the statue were first fixed. The structure was gradually erected as the bronze form was fortified with an iron and stone framework. To reach the higher parts, an earth ramp was built around the statue and was later removed. When the Colossus was finished, it stood about 33 meters (110 ft) high. And when it fell, “few people can make their arms meet round the thumb”, wrote Pliny. A strong earthquake hit Rhodes at around 226 BC. The city was badly damaged, and the Colossus was broken at its weakest point – the knee. The Rhodians received an immediate offer from Ptolemy III Eurgetes of Egypt to cover all restoration costs for the toppled monument. However, an oracle was consulted and forbade the re-erection. Ptolemy’s offer was declined. For almost a millennium, the statue lay broken in ruins. In AD 654, the Arabs invaded Rhodes. They disassembled the remains of the broken Colossus and sold them to a Jew from Syria. It is said that the fragments had to be transported to Syria on the backs of 900 camels. Let us clear a misconception about the appearance of the Colossus. It has long been believed that the Colossus stood in front of the Mandraki harbor, one of many in the city of Rhodes, straddling its entrance. Given the height of the statue and the width of the harbor mouth, this picture is rather impossible than improbable. Moreover, the fallen Colossus would have blocked the harbor entrance. Recent studies suggest that it was erected either on the eastern promontory of the Mandraki harbour, or even further inland. In any case, it never straddled the harbor entrance. Although we do not know the true shape and appearance of the Colossus, modern reconstructions with the statue standing upright are more accurate than older drawings. Although it disappeared from existence, the ancient World Wonder inspired modern artists such as French sculptor, Auguste Bartholdi, best known by his famous work, the ‘Statue of Liberty’ in New York. Today, the Colossus is regarded as one of the Seven Wonders of the World and a masterpiece of art and engineering.